There was an interesting article in Forbes the other day. Using data from Zillow, the magazine listed the metros with the greatest increases in housing rental rates. The top of the list was populated by metros you’d expect to see: San Francisco, San Jose, Denver, Austin and Portland, for example. But, there was one somewhat surprising, and very familiar metro coming in fourth on the list. Our very own Kansas City saw a year-over-year increase in rental rates of 8.5 percent. Only San Francisco, San Jose and Denver were higher. So what exactly can we make of this? Obviously there is incredibly high demand for housing in some of these fast-growing metros. That demand usually leads to higher rental rates. The Kansas City metro grows at a more modest rate, and our housing costs have historically been relatively low. These factors have not changed. So what is behind our rising rents? It is likely a supply issue. The chart below shows multi-family housing permits issued in the metro by year. After peaking in the early 2000s, multi-family housing cooled rapidly and finally bottomed out in 2010. 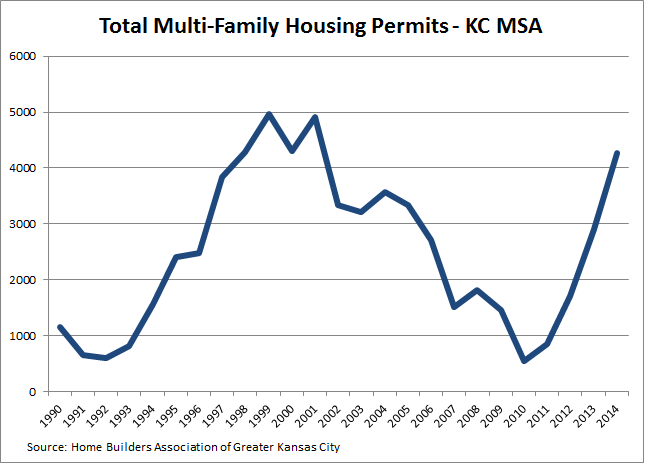 Even as the economy slowed, Kansas City continued to see population growth, and now we are seeing a spike in multi-family permits as builders look to meet pent-up demand. Housing takes a while to build and until construction can meet the demand, we will see upward pressure on rents. We also see more and more people interested in urban-style housing in denser settings (which is more likely to be rental). This trend has also contributed to the increase in rents, both here and nationwide. So is it all good news? Kansas City remains an affordable metro, but rising rental rates could cause strain for some, especially those on fixed incomes. If rates surge for an extended period of time, we could face housing affordability problems similar to what other metros are facing. Rising rents generally indicate a healthy metro economy. As Kansas City’s economy is starting to gain some traction, we should not be too surprised to see rates increasing. We might not often rank at the top of lists with the San Francisco’s and San Jose’s of the world, but we can look at our current status as a sign that our future looks bright. 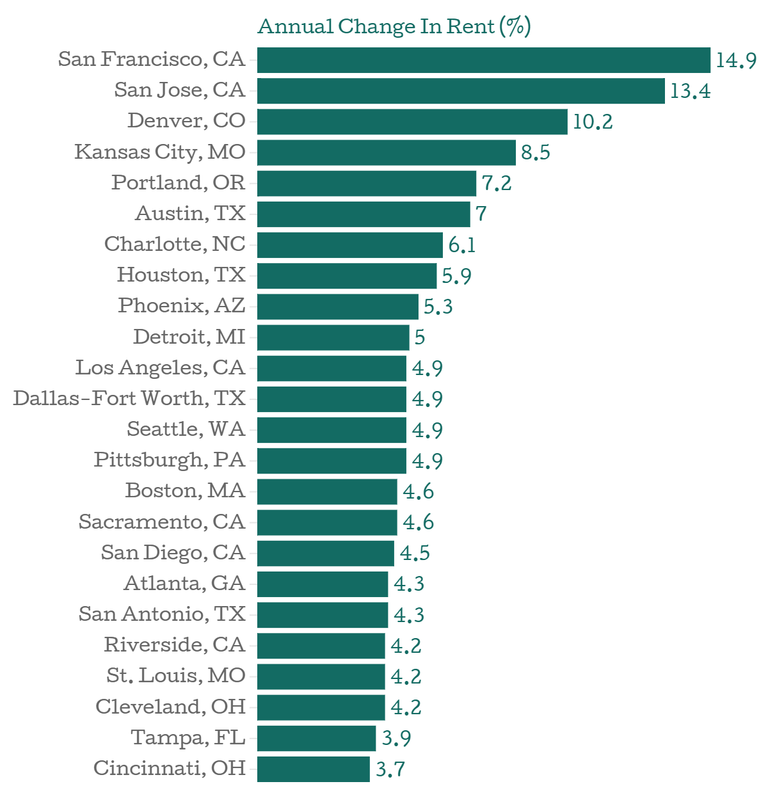 Are you seeing higher rents? Are you finding it difficult to find rental housing? Let us know by leaving a comment.